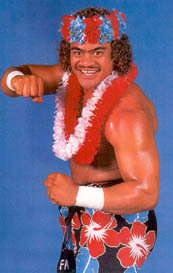 - WWF Saturday Night's Main Event #10 (February 21, '87) = Islander Tama competed in a Battle Royal, which was won by Hercules. - WWF King of the Ring Tournament '87 (September 4) = Islander Tama lost in the first round to the Junkyard Dog. Randy Savage won the tournament. - WWF Survivor Series '87 (November 26) = The Islanders (Tama & Haku), the Hart Foundation, Demolition, the Bolsheviks, & the Dream Team fought in a "Tag-Team Elimination" Match against the British Bulldogs, the Killer Bees, Strike Force, the Young Stallions, & the Rougeau Brothers. The Islanders were eliminated by the Killer Bees, who 'survived' along with the Young Stallions. - NWA Halloween Havoc '89 (October 28) = The Samoan Swat Team (Samoan Savage, Fatu, & Samu) won over Steve Williams & the Midnight Express. - NWA Starrcade '89 (December 13) = The Samoan Swat Team (Samoan Savage & Fatu) took down Doom and won, via DQ, over the Steiner Brothers, then lost in the finals of the Iron Team Tournament to the Road Warriors. - NWA Clash of the Champions X (February 6, '90) = Samoan Savage was pinned by Steve Williams. 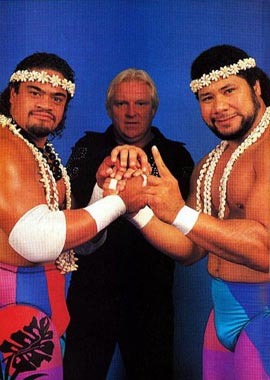 - NWA Capital Combat (May 19, '90) = The Samoan Swat Team (Samoan Savage & Fatu) defeated Mike Rotunda & Tommy Rich. - NWA Clash of the Champions XI (June 13, '90) = The Samoan Swat Team (Samoan Savage & Fatu) were beaten by Tom Zenk & Mike Rotunda. - Heroes of Wrestling (October 10, '99) = The Samoan Swat Team (Samoan Savage & Samu) took down Marty Jannetty & Tommy Rogers.